Only online audition submissions will be accepted. 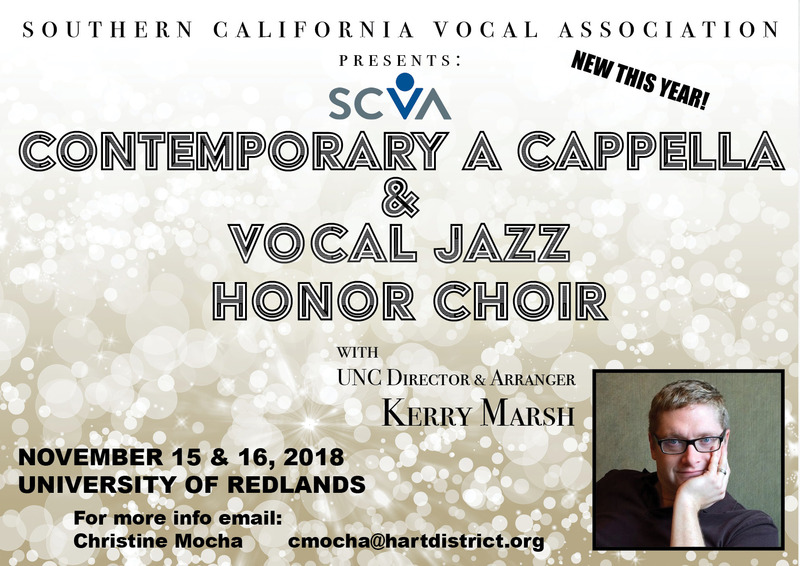 Selected students will rehearse together over the honor choir rehearsal dates of Thurs-Friday Nov. 15th and 16th in Redlands, CA and perform in an “Honor Choir Concert Performance” on November 16, 2018. Students must attend all two days of rehearsals leading to the performance. Students are selected for one choir only, VJCA Choir or SATB, SSAA or TTBB Choir. Your school music director must be a member of SCVA in order for you to participate. To join, go to scvachoral.org. Record a new audition piece to be reviewed by SVCA judges. Upload your recording to SoundCloud and then add it to your application on CSMusic.net. For more information contact Christine Tavares-Mocha at cmocha@hartdistrict.org. Plus, your registration includes online access to all of CSmusic.net including these great benefits. Opera and theater stars give you an inside look at their path to success with advice for today’s singers. Thousands of job notices for singers, teachers, and pianists. Directories of Young Artist Programs, Universities and Summer Programs.